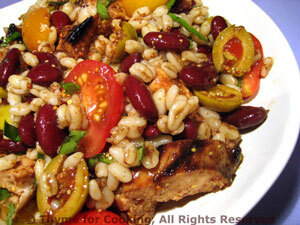 Barley and Teriyaki Chicken Salad, Thyme for Cooking summer salads. Spoon the Teriyaki sauce over the chicken breasts and set aside to marinate for a few minutes. When ready, cook on barbecue grill for 10 - 12 minutes, turning once or under broiler for same amount of time or sauté in non-stick skillet for 12 - 15 minutes, until done. Cook barley in chicken stock according to package directions. Cut tomatoes into slices, then quarters. Whisk mustard, vinegar and Teriyaki together in a small bowl. Drizzle in olive oil, whisking constantly, until thickened. Fluff barley, drain if needed. Add vinaigrette, stir gently to combine and serve.